IPl 2019 Free Broadcast Channels,KKR Vs RR IPL 2019 Live Streaming: Watch Match In HD Quality on Hotstar, Airtel TV, Reliance Jio TV For Free. Indian Premier League 2019 (IPL 2019) is being treated as the festive season in India and now the first round of this IPL is about to complete as all the teams have already played their first five match. If we talk about today’s match, we have two cricket matches to watch, one will be played between Royal Challengers Bangalore (RCB) vs Delhi Capital (DC) and the second will be played between Rajasthan Royals (RR) vs Kolkata Knight Riders (KKR). Meanwhile, everyone will keep an eye on Virat Kohli led RCB on April 7, as they have not won a single match despite playing five. Before getting more details about live streaming, Start time, venue, updated time table and live score of today’s match, let’s take a look at Yesterday’s highlights. In the second match on April 6, West Indies right arm fast bowler, Alzarri Joseph, who made his IPL debut on Saturday took six wickets and became the only cricketer to achieve this milestone. It is to be noted that Alzarri Joseph gave merely 12 runs. In the first season of IPL, Pakistani left-arm bowler Sohail Tanvir had taken six wickets by giving14 runs. Due to his outstanding bowling, Mumbai Indian managed to win by 40 runs. Chennai Super Kings (CSK) has once again earned their playback on the top of the IPL 2019 points table. MS Dhoni-led CSK has won four out of five matches. 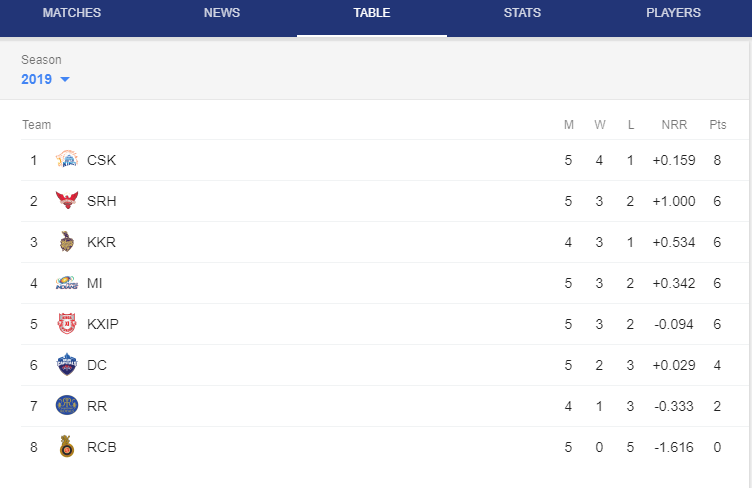 The second position in this IPL point table has been bagged by Sunrisers Hyderabad and followed by Kolkata Knight Riders, Mumbai Indian and Kings XI Punjab. Rajasthan Royals to take on Kolkata Knight Riders in the IPL 2019 match 21. It will be played at RR home venue- Sawai Mansingh Stadium in Jaipur. The RR vs KKR is likely to start at 08:00 p.m (IST). The cricket lovers can watch the IPL match on TV Channels and online streaming on mobile for free. As we have earlier told you that Star Sports holds the telecast rights of IPL 2019 and will broadcast the match live across its network. The live streaming online of IPL 2019 will be available on Hotstar app and website. Fans can click here, for RR vs KKR live score updates. Notably, the live streaming online of Today’s IPL cricket match will be available on Hotstar app and website. Fans can click here, for RCB vs DC live score updates. Can I watch the IPL 2019 Live Streaming for free?